Keates Car and Van is a new venture for Oliver Keates and his father, Don. Together they have vast experience with 50 years of working in the motor trade. We have recently moved to our new workshop in Hilperton where we have also invested in all new equipment. Car & Van Servicing, Car & Van MOT�s and Car & Van repairs. Oliver is the fourth generation of his family in the motor trade in the West Wilts area. His father, Don was a partner in Keates Garages Ltd in Bradford on Avon. His grandfather, another Donald, and great-grandfather, Reginald were also proprietors of the business in partnership with other members of their family, Ron, Basil and Steven. 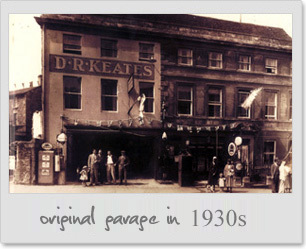 The original garage was established in 1910 by D R Keates and known by that name for many years. It was in St Margaret�s Street in Bradford on Avon. The picture is from the 1930s and shows the original garage. In the 1960s the garage moved to Frome Road, on to land bought by the family from the railway. The picture shows Oliver�s great-grandfather, Reg on the forecourt of the new garage. The garage remained there until 2006. 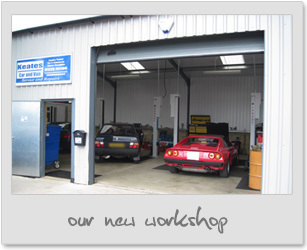 Keates car and van, now have a NEW workshop with all NEW equipment. Our mechanics are fully qualified and have ove 50 years of experience between them. We work on commercial, domestic vehicles and all models.